NIA, National Investigation Agency is inviting online application from all Eligible Indian Citizens for filling up various Data Entry Operator, Programmer & Analyst posts. 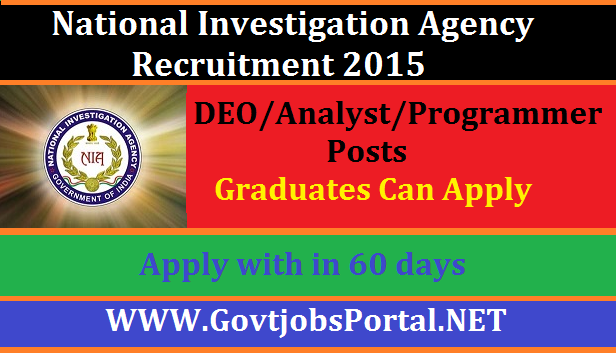 There are total 41 vacancies which are going to fill by NIA under this recruitment process. Read the below article carefully to know the Educational Eligibility & other requirements required to fill this job application. Also must read the detailed advertisement carefully before applying. 5. Additional Superintendent – 04 Posts. Educational Qualification: Candidates having Graduation in relevant discipline can apply for this NIA Recruitment Process. Applying Mode: Candidates may the send hard copy of application form along with relevant certificates as mentioned in official advertisement to “(AIG)ADM, NIA HQ, 7th Floor, NDCC II Building, Jai Singh Road, New Delhi – 110001” before or on With In 60 Days.